We’d love your help. Let us know what’s wrong with this preview of The Gilded Cage by Lucinda Gray. After growing up on a farm in Virginia, Walthingham Hall in England seems like another world to sixteen-year-old Katherine Randolph. Her new life, filled with the splendor of upper-class England in the 1820s, is shattered when her brother mysteriously drowns. Katherine is expected to observe the mourning customs and get on with her life, but she can't accept that her broth After growing up on a farm in Virginia, Walthingham Hall in England seems like another world to sixteen-year-old Katherine Randolph. Her new life, filled with the splendor of upper-class England in the 1820s, is shattered when her brother mysteriously drowns. Katherine is expected to observe the mourning customs and get on with her life, but she can't accept that her brother's death was an accident. To ask other readers questions about The Gilded Cage, please sign up. Is The Gilded Cage historical or contemporary fiction? Rosie Best It's historical. Set in 1820s England with a heroine from America. Yet another "okay but not great", "I liked it but didn't love it" type. Actually, I don't even know if I liked this book? I think it was okay and worth the read (for me, since I had a review copy), but not really that good. I'm still between three stars and two stars, honestly. You're not missing out - I'd recommend skipping it if you don't have a review copy. This book starts with the prologue, in which Katherine Randolph and her older brother George are living on the farm in Virginia with their foster parents. One day, a man arrives, and asks for George, who isn't there. The man tells Katherine that he'll wait for George to come back, and that her and George's futures are about to change. Then the story really starts, at chapter one, with George and Katherine in England, four weeks later. Their grandfather died, and since their parents are also dead, everything goes to George, and Katherine. Their cousins Grace and Henry are their guardians at Walthingham (the estate/land/property George and Katherine inherit). But then George dies mysteriously, drowned in an icy lake. Katherine knows his death is no accident, but no one believes her. Though she is to be in mourning for the next six months, Katherine is determined to find out what happened to her brother, and what is really happening at Walthingham. I like historical fiction novels. I read a lot of adult historical romances, and so reading a YA historical fiction novel is usually pretty fun. Gray does a good job of making the setting very believable and authentic, with all of the customs and traditions and proper behavior and manners. Though I hated it, the author got Katherine's helpless right - as a young, newly titled woman, Katherine could not do much at first, to figure out what happened to her brother. She is often ushered from the scene, sent to bed, told not to worry about things. This is true of the time period, and heartbreaking. I didn't mind Katherine - though she is often helpless to do anything, she is inquisitive and very determined. She has good instincts, but she often tries to see the best in people. She's sweet, but she also has a temper. I liked reading from her perspective. I had my suspicions, in terms of who killed George. I wasn't really sure what was going on in the estate and the woods in general though. Many were afraid of the "Beast of Walthingham", which Henry and Grace dismissed as folklore. But Katherine wasn't so sure... she also wasn't sure what to think of a poacher and former gamekeeper at Walthingham, who has a knack for showing up where he isn't wanted. Same for two men who kept demanding for the attention of the master of Walthingham. Mystery upon mystery! Again, I had my suspicions about the killer, but what I wasn't sure about was the creepy stuff happening in the woods, and the shadows that Katherine kept seeing. So the mystery was kind of cool to try and figure out. I didn't really love the story, but it was interesting to read it. The ending had a lot going on, but I liked that everything wrapped up. Now, on to that which I didn't like! Apologies if this section doesn't make sense or doesn't really explain how I felt. Honestly I'm feeling a little apathy at the moment, and there are things that I know I didn't like as I was reading the book, but I couldn't bring myself to really care enough to try and explain them. So, bear with me. Where to start? I'm not even quite sure of what I didn't like. To me, the plot of the book felt rushed and choppy. Things happened way too quickly. Sometimes rapid-fire action works in a story, but this story didn't feel fleshed out. We get to know Katherine really well, as she is telling the story, but the other characters felt very one-dimensional. I didn't feel any real inclination towards any of the secondary characters, and there were plenty. It's clear that Katherine has a little crush on John, one of the footman in the house. And Katherine befriends Jane, the magistrate's daughter. There is Grace, Katherine's cousin, who is kind of cold, though you wouldn't know at first. Henry too - he seems nice, but is he really? I liked John, but again, one-dimensional. The only character that truly drew a reaction from me was Grace - I hated her from the start. There are two romantic love interests in this book, though I can't really call it a love triangle? It's weird. We know Katherine developed a crush on John at some point. She meets Mr. William Simpson, the family's lawyer, and he's this adorable awkward clumsy mess around Katherine. She kind of develops a crush on him too. The thing with this romance is that the feelings don't develop at once - basically, the romances happen separately. At first there is one guy and Katherine, and then that guy stops showing up in the story (for good reason). And then there is Katherine and the other guy. I don't really like any story with two love interests, whether they are simultaneous or one after the other. I liked both men in this story, but only one as a love interest. I picked the wrong side. I still like him too, but I didn't like the way the author went about "resolving" the triangle. Speaking of romance - it was insta-love on both accounts. Not really enjoyable, and not really a romance to root for (in either case). Katherine and one guy were really passionate, for like, a second. Katherine and the other guy are really dull and boring. But in both cases, we have insta-love, and there is a serious lack of scenes with Katherine and either love interest together. Boring! Did I mention that the whole story felt rushed? The ending especially. SO much happened in the ending, and it was hard to pick apart what made sense and what didn't. We have kidnappings and asylums and high-speed chases on horses - the asylum part threw me off, I wasn't expecting that. Even after finishing the book, I'm still a little unclear as to what was happening in the woods, and what was scaring everyone. Was there a Beast of Walthingham? Because the ending of the book says yes AND no. So, the book felt rushed, the characters were flat, there is sort-of kind-of love triangle, the ending was a little confusing (though, for the most part, it wrapped up everything). This book is very short, which doesn't really help in terms of the rushed plot and lack of characterization/character development. I don't mind that I read this book, but I didn't really like it. Meh. Ehhh, no. I can't recommend this book. I hesitate to give this book two stars because I don't really feel negatively towards this book - it's more like it wasn't wonderful and I just don't really care. It's one of those books that I'll completely forget about, given some time from now. I like seeing more historical fiction in YA, but this one didn't do much for me. I loved the premise to this and I was eager to get started. I really liked Katherine. She's not made of the same things the regency women are and it was amusing to see her maneuver around in English society. There are a few other secondary characters, but it felt like we only got to see the surface of them. It was a very effective way to show Katherine's feeling of isolation. There were a couple of twists that I didn't see coming and a satisfying ending. Overall, a quick, enjoyable read. I ordered this book because of the period it's set in. The early 1800s are one of my favourite historical periods to read about, especially when set in England. I had seen some negative reviews, but still wanted to read it, to see what I thought. Unfortunately, I probably would've been better off not getting this book, or at least waiting for my library to get it instead. 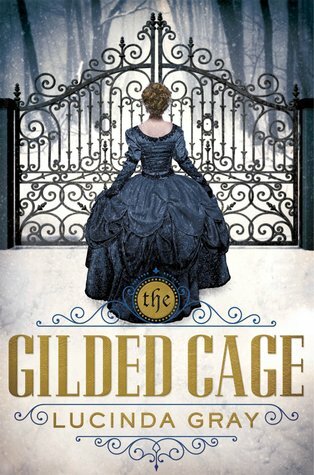 The Gilded Cage begins in Virginia, USA, when Katherine Randolph discovers that she and her brother are the heirs to the Walth I ordered this book because of the period it's set in. The early 1800s are one of my favourite historical periods to read about, especially when set in England. I had seen some negative reviews, but still wanted to read it, to see what I thought. Unfortunately, I probably would've been better off not getting this book, or at least waiting for my library to get it instead. The Gilded Cage begins in Virginia, USA, when Katherine Randolph discovers that she and her brother are the heirs to the Walthingham country estate in England, and skips forward four weeks, to their presentation ball. Katherine and George are starting to settle into the stuffy life of British aristocracy, when a terrible 'accident' happens, and George is found dead in an icy lake. Everyone believes it was just an accident, a slip in the icy after a drunken night; everyone that is, except for Kat. After rumours of a beast of Walthingham start to circulate, she believes there was something shady at hand, and won't stop at nothing to find out the truth. I liked Kat, I did, but she wasn't anything special. There wasn't really anything about her to make her memorable, and I'll probably forget about her soon enough, if I'm being really honest. Like many women of that time, she's treated like a frail, young thing, often sent to bed or excluded for conversations, so as not to disturb her delicate sensibilities. No one really takes her seriously, and she is helpless, even though she's now the sole heiress to the large estate. I did like the tiny romantic aspect between Kat and Mr Simpson, the estate's lawyer. He was the only one to see Kat as a real person, capable of thought and reason, and not some vapid socialite who needs coddling. Because Kat is only 16, and unmarried, she needs to be under the guardianship of her two cousins, Grace and Henry, who I disliked from the beginning. There always seemed to be something off about the pair, and the further you get into the book, the more and more this feeling grew. I liked the mysterious aspect, of whether there was a 'beast' or not roaming the grounds, and because of that, the book is a 3 star read. However, it dragged on at times, and then the ending was so rushed, it was unbelievable. Honestly, parts of the middle section could've been completely scrapped, if the ending would've had a bit more care taken, it would've been more enjoyable to read. Synopsis: After growing up on a farm in Virginia, Walthingham Hall in England seems like another world to sixteen-year-old Katherine Randolph. Her new life, filled with the splendor of upper class England in the 1820s, is shattered when she discovers the corpse of her brother George in a lake on the estate-the tragic accidental drowning of a young man, the coroner reports, despite the wound to George's head. Katherine is expected to observe the mourning customs and get on with her life, but she can't accept that her brother's death was an accident. A bitter poacher prowls the estate, and strange visitors threaten the occupants of the house. There's a rumor, too, that a wild animal stalks the woods of Walthingham. Can Katherine retain her sanity long enough to find out the truth? Or will her brother's killer claim her life, too? Katherine's character was well developed and girl had some grit. Katherine’s transition from life in Virginia to life at Walthingham was understandably rocky. She felt out of place, and lonely, and lost at times. All of which were exacerbated by the sudden loss of her brother. When Katherine discovers some details surrounding the death of her brother that just don’t add up, she is determined to peel back the layers of Walthingham to discover the truth. She was not going to be undeterred by the pressure to be proper, or the fact that she was a woman, or by weak explanations surrounding George’s death. Although it was pretty brief in the story, I loved Katherine’s relationship and bond with her brother. They had a hard life, but they always had each other. He was her bright spot to Walthingham’s bleakness. He was her rock when everything else in her life seemed to fracture. When I was in preschool, this older kid kept biting me. I would come home with bite marks all up my arm. My big brother told him that if he kept it up he was going to give him a "knuckle sandwich" :) I guess my arm was too irresistible, and sure enough my brother followed through on his promise and the biting ceased. I completely hero-worship my older brother, so I could relate to Katherine’s relationship with George, and appreciated the depiction of a really strong sibling relationship. While Katherine’s character, and even George’s (though brief), were pretty well developed, I found the other characters to be a little one-dimensional and flat. I think there was a missed opportunity to add some depth and layers to some of the important secondary characters, and as a result these characters and their relationship with Katherine felt stunted and underdeveloped. That said, the mysteriousness and suspense surrounding the events at Walthingham, while somewhat predictable, kept me invested in the plot and turning the pages. Overall, an enjoyable read! I received a free digital copy of this book from Netgalley in exchange for an honest review. This does not shape or change my opinion of the book. Huge thanks to Macmillan Children’s Publishing Group and Netgalley for the review copy! i received this book through a goodreads giveaway. reviewing books received through giveaways is encouraged but not required. i was...not a fan of this book. it was boring, for one thing. though i also didn't love the one i just read that took place in the 19th century, at least i could call that one exciting. this one, not so much. also, the protagonist was fairly unlikable and also pretty dumb. you know how once in a while a protagonist will do something silly, or not see something perceived as i received this book through a goodreads giveaway. reviewing books received through giveaways is encouraged but not required. also, the protagonist was fairly unlikable and also pretty dumb. you know how once in a while a protagonist will do something silly, or not see something perceived as obvious, and they're all "oh, i'm so stupid!" and how most of the time you can forgive them, because either a) it's understandable or b) you liked them? well, neither a nor b is the case in this book, though the protagonist bemoans herself a fool several times. there were not one, but two romances in this book. i hesitate to call them "torrid," because it seems like an even stronger word is necessary. our lovely protagonist (Katherine--called Kat by her friends, because that's so 1820s) falls in love with 2 uncharacterized, flat dudes she has encountered only a handful of times, respectively. (view spoiler)[here's a specific thing that just kind of grinds my gears. the wonderful Kat ends up in an ASYLUM toward the end--classic--and not only is she, education-free, smart enough to determine that the highly normalized treatments of the time (i.e., leeching) are not a-O.K., she FREES EVERY SINGLE INHABITANT OF THE ASYLUM. FREES THEM. even operating under the character's naïve assumption that everysingleoneofthem is as wrongfully imprisoned as she is, they'd need some sort of treatment for what they'd just gone through! but nooooo. instead, Kat frees them all, either sending them back to their families--which even loverboy #2 William Simpson halfheartedly declares "for better or worse"--or EMPLOYING THEM. IN HER MANOR. BECAUSE (hide spoiler)]IF ALL THAT SILLINESS WEREN'T ENOUGH, THE ENTIRE CONCEPT OF THIS BOOK IS THAT SOME FARMGIRL IN VIRGINIA IS A LONG-LOST ENGLISH LADY. Main reason I picked this one up? That cover. It drew me in completely. Even the inside is gorgeously designed mimicking the outside cover with its whirls and whorls. Couldn't help but click on it to request it. And I just love the historical genre so imagine my surprise when reading this synopsis that it ends up being a murder mystery. I love the first half of this book. It had all the makings of a well-established setting and a mystery that you couldn't help but try to decipher on your own. I w Main reason I picked this one up? That cover. It drew me in completely. Even the inside is gorgeously designed mimicking the outside cover with its whirls and whorls. Couldn't help but click on it to request it. And I just love the historical genre so imagine my surprise when reading this synopsis that it ends up being a murder mystery. I love the first half of this book. It had all the makings of a well-established setting and a mystery that you couldn't help but try to decipher on your own. I was all up for some paranormal magical bit waiting to emerge but to my dismay I was incorrect with my assessment. And then I kept reading and my star rating ended up going down. The second part included unnecessary tolls and troubles that I didn't really think was too important. Unless one believes that said secondary character deserved a better ending. 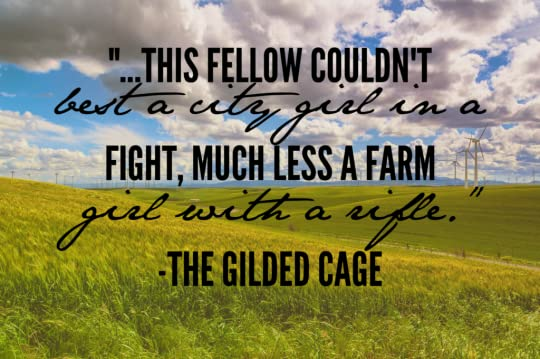 The one glaring aspect of The Gilded Cage is how women are portrayed and modeled in the book. What makes it more problematic is that it was probably the norm back then. Giving medicine to women who has emotional outbursts and probably carting them off to mental wards just because their family couldn't deal with them. And then there's the mere fact that it ends on such a depressing tone and context. I don't want to read a book that will dampen my mood, but this one did. I was just so heartbroken for Katherine that even that ending barely gave me any hope for her at all. The writing was very fluid and being tucked away into her little world was a good reprieve even if it was tormenting for the main character. I was heavily invested in the story-line and wanted so much more for Katherine. Pick this one up if you're looking for a historical murder mystery but I do warn you, it can be a bit heavy at times. So glad I took a chance and read this one! I had a hard time believing that a suspense story set in the Victorian era would get such consistently bad reviews, even from my friends who adore historical fic… but now I understand. The Gilded Cage was dull. That’s about it. This whole book can be summed up in that short sentence. Everything from the writing to the characters to the plot was dull, dull, dull. Gray had a wonderful premise, an idea that I have seen well executed - with obvious divergence - multiple times. However, she breathed I had a hard time believing that a suspense story set in the Victorian era would get such consistently bad reviews, even from my friends who adore historical fic… but now I understand. The Gilded Cage was dull. That’s about it. This whole book can be summed up in that short sentence. Everything from the writing to the characters to the plot was dull, dull, dull. Gray had a wonderful premise, an idea that I have seen well executed - with obvious divergence - multiple times. However, she breathed no new life into the tropes. It is hard enough being engaged by a dull narrator doing dull things but it is made so much worse when it is also relayed to us in a dull manner. Not a single character in this book had a personality. The whole cast was flat. Katherine, our protagonist, was just... forgettable. She had nothing unique about her. She was meant to be intelligent but made dumb decisions. The was also a love triangle. Kind of. I don’t quite know what was meant to be happening with these characters. Katherine was said to have fallen in love not once but twice; both with underdeveloped minor characters that we barely got to know. I felt nothing towards any of the characters. The plot was a bit of mess. I am not even going to talk about it because of spoilers but let's just say that there was a whole subplot with an asylum and it was horrendous. I had high hopes for this one and I was left with disappointment. More thoughts to come! 1.5 stars. I didn't quite get what I was hoping for with this novel. Nor did I find it, in any way, to be something new or refreshing, and I also didn't particularly feel anything for these characters and their circumstances. I will say that, at the very least, it kept me reading, because I was curious how things would turn out in the end. But all in all? Not so impressive. Katherine's world is about to change from a farmland regular to a woman of wealth. And from there her world just keeps on turning. Her brother - her last known living family relative - mysteriously dies and rather than following the mourning customs Katherine takes it upon herself to figure out the truth. This book was intriguing. It started and reminded me of Pocahontas 2. When Pocahontas decides to go to England to see what life is really like in the town. This changing of venue shocks the char Katherine's world is about to change from a farmland regular to a woman of wealth. And from there her world just keeps on turning. Her brother - her last known living family relative - mysteriously dies and rather than following the mourning customs Katherine takes it upon herself to figure out the truth. This book was intriguing. It started and reminded me of Pocahontas 2. When Pocahontas decides to go to England to see what life is really like in the town. This changing of venue shocks the characters. It puts them in a transition period that is intriguing to everyone. Katherine is use to being the kind of girl who gets her hands dirty and therefore when she is forced to be the proper woman of wealth it becomes a difficult task. When her brother drowns things start to change for Katherine. We see a girl torn up by a relative passing, and no one wants to let her find out what really happened. This puts Katherine in a place of growth - one that shows what her true character is. Mysterious characters enter her life and she handles them as readers would expect. Gray does a good job at transporting you into the world of the 1820's and she keeps you riveted by an engrossing story. Disclaimer: I received an ARC of this book in exchange for an honest review. I'm SO disappointed by this one. There was such hope and promise from the first 50% and it was whittled down to JAMIE BEING REALLY DISAPPOINTED. I anticipated a creative, unique gothic novel with a excellent twist and got... this. We knew the outcome at 60% and STILL HAD SO MUCH BOOK LEFT. And the fact that she went into an (view spoiler)[asylum. (hide spoiler)] What was the point of that? To show that it could happen? G Disclaimer: I received an ARC of this book in exchange for an honest review. I'm SO disappointed by this one. There was such hope and promise from the first 50% and it was whittled down to JAMIE BEING REALLY DISAPPOINTED. I anticipated a creative, unique gothic novel with a excellent twist and got... this. We knew the outcome at 60% and STILL HAD SO MUCH BOOK LEFT. And the fact that she went into an (view spoiler)[asylum. (hide spoiler)] What was the point of that? To show that it could happen? Great. Cool. Think of something better next time, thank you very much. I would say unless someone physically hands you a copy of this book and then forces you to read it, don't bother. And really, who would do that. My expectations for The Gilded Cage were fairly low, mostly because I hadn’t heard anything about it. Then again, I read it a month before publication. I’m suddenly ahead, and I’m not really sure how that happened. The Gilded Cage proved a fun historical read, though more for the fast pace than the cleverness of the mystery. The plot passes pleasantly, with many a dark turn. While the direction the plot headed was obvious from the beginning, the path Gray took to get there proved surprising at se My expectations for The Gilded Cage were fairly low, mostly because I hadn’t heard anything about it. Then again, I read it a month before publication. I’m suddenly ahead, and I’m not really sure how that happened. The Gilded Cage proved a fun historical read, though more for the fast pace than the cleverness of the mystery. The plot passes pleasantly, with many a dark turn. While the direction the plot headed was obvious from the beginning, the path Gray took to get there proved surprising at several points. The fast pace kept me engaged in the outcome, as did the enjoyableness of Katherine’s voice. Obviously, I’m a sucker for historical novels with balls and dresses and all of that. Katherine’s a farm girl who inherited a British estate, and that adds a slightly original something to this tale, which is a variation on things I’ve read before. She’s determined and strong, though not the brightest at figuring out what’s going on. Much as I enjoyed it, the characterization of anyone who isn’t Katherine lacks. The romance is like quarter-assed, at best. I don’t dislike it, but everything comes so abruptly. Her friendship with Jane starts well, but then only appears at plot points. The Gilded Cage would have been better with a bit more length that could have been devoted to developing those relationships. Also, warning: animal death. 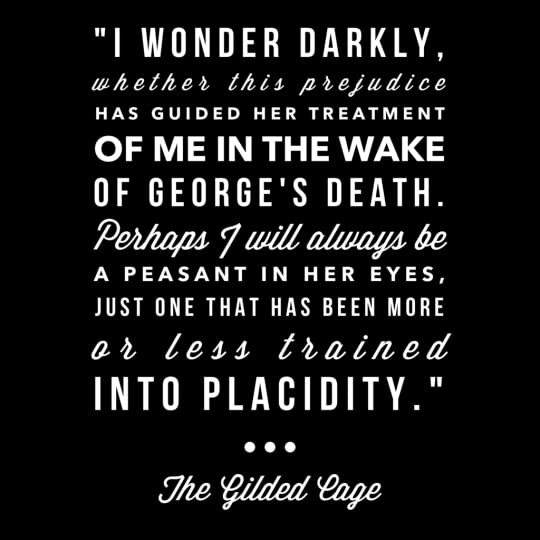 The Gilded Cage is an atmospheric thriller set in the Regency era. Best for fans of thrillers, this book centers around the strange happenings at Walthingham Hall. While Katherine is our heroine, we don't fully get to dive into her character as we may have liked. The focus centers largely on who killed her brother. Long-time readers of thrillers likely won't be surprised by any turn of events, although that didn't stop The Gilded Cage from being an interesting book---something that would likely m The Gilded Cage is an atmospheric thriller set in the Regency era. Best for fans of thrillers, this book centers around the strange happenings at Walthingham Hall. While Katherine is our heroine, we don't fully get to dive into her character as we may have liked. The focus centers largely on who killed her brother. Long-time readers of thrillers likely won't be surprised by any turn of events, although that didn't stop The Gilded Cage from being an interesting book---something that would likely make a good movie or TV adaptation. We're dropped into Katherine's life without much context, given facts (like her animal companion Stella) and little more (Stella's animal identity isn't revealed until page 95). The Gilded Cage is a standalone novel set both in Virginia, and England in the 1820's. 16-year old Katherine Randolph and her older brother George are living the quiet life on a farm in Virginia where they reside with their foster parents who have raised them since their parents passed away. Katherine meets a man named Edward Delaney who is looking for George. Herman claims that the siblings lives as they know it, are about to fundamentally change after a Grandfather they never knew about passes away and leaves behind a fortune to them. I didn't dislike this book. The pacing was strange, though. I can’t remember how I came across this book, but it intrigued me enough to borrow it from the library. Thinking back on the story, I must say that it was a very concise story in comparison to other books of similar length. It maintained it’s sole focus on the main plot with little detail going beyond it, with most of the attention placed on the creation of dismal and hard to escape situations. I didn’t particularly like the main character and she was at times the cause of much frustration, but h I can’t remember how I came across this book, but it intrigued me enough to borrow it from the library. Thinking back on the story, I must say that it was a very concise story in comparison to other books of similar length. It maintained it’s sole focus on the main plot with little detail going beyond it, with most of the attention placed on the creation of dismal and hard to escape situations. I didn’t particularly like the main character and she was at times the cause of much frustration, but her story held enough mystery to keep me going. The writing was good and I am impressed with the author’s ability to create seemingly desperate situations without the need for melodrama. I was entertained more so than impressed, and that is perfectly fine. The book did its job! Gothic cliches abound in this one, particularly the romantic Gothic, and I ate it up with a spoon. One of the biggest things I noticed about this book was the number of stark contrasts and dualities (hey, Gothic!). This begins in 1820s Virginia, and Katherine is a born and bred American girl. To travel to 1820s England, and reprise the role of an English heiress, is vastly different from what she's used to. 1820s America and 1820s England are two very different realities and societies, class distinction aside. When Katherine arrived in England, she makes the brilliant observation that she belongs with the servants -- not because she doesn't feel like an heiress, but because she has the life skills and sensibilities most suited to the working class. Her identity lies with them, not in propriety, manners, and dull dinner parties. What really kept me on the edge of my seat and nearly bumping this to four stars was the last 75 pages. The twist made me bite my nails in anticipation. Because it was thrown in here -- no worries, the twist made sense! -- I found it unexpected and wondered constantly what would happen next. Our story takes place in the 1820's. duty filled lives of young Virginia and George Randolph. Brother and sister are notified that they have inherited, from their grandfather, Walthingham Hall in England. urban society of England is facilitated by cousins already living there. Soon her brother, a fastidious swimmer, mysteriously drowns. prowl the estate and the legend? of a wild animal stalking the woods re-emerges. The novel offers a historical presence with Gothic psychological suspense and murders to be solved. This is the only English work that I found by Lucinda Gray. 9 additional Spanish novels were listed on Goodreads . The plot sounds great, but the writing is bad, overwrought romance novel writing, with more than one 21st century phrase inserted to jar the nerves.I don't know who Lucinda Gray really is, but writing this under a pseudonym is probably a good move. And if she lives in London, doesn't she have access to something, say, the local newspapers to start with, to teach her correct forms of address for peers and nobility? The heroine is NOT "Lady Randolph" she is "Lady Katherine Randolph," should be addr The plot sounds great, but the writing is bad, overwrought romance novel writing, with more than one 21st century phrase inserted to jar the nerves.I don't know who Lucinda Gray really is, but writing this under a pseudonym is probably a good move. DNF at 28%. Boring & predictable. The writing was trying too hard to be pretty/evocative & the characters were completely flat. Not for me but it definitely has an audience out there. Very enjoyable. Good mystery, pleasant if under-developed romance. Not a ton of character development across the board but I liked the protagonist well enough. Check out my blog Eternity Books to see this review and others! Summary: After growing up on a farm in Virginia, Walthingham Hall in England seems like another world to sixteen-year-old Katherine Randolph. Her new life, filled with the splendor of upper-class England in the 1820s, is shattered when her brother mysteriously drowns. Katherine is expected to observe the mourning customs and get on with her life, but she can't accept that her broth Check out my blog Eternity Books to see this review and others! Summary: After growing up on a farm in Virginia, Walthingham Hall in England seems like another world to sixteen-year-old Katherine Randolph. Her new life, filled with the splendor of upper-class England in the 1820s, is shattered when her brother mysteriously drowns. Katherine is expected to observe the mourning customs and get on with her life, but she can't accept that her brother's death was an accident. Katherine Randolph is the main character of the book and is probably the best fleshed out character. She's feisty, strong, and not like most girls that you'd find in England's high society. She's also pretty stubborn, in my opinion, but not in a good way. I'll elaborate on that later. George Randolph is Kat's brother. He's described as a dreamer, artist, and in the few glimpses we have of him, as a loving brother who loves to tease. And then the tragedy occurs. Henry and Grace Campion are Katherine's cousins who are her and George's guardians. From the start, they are very unlikable, especially Grace. She really fits into the world of aristocracy and I don't mind at all what happened to her eventually. Henry is a mystery that grows even deeper as the story progresses. There are several other side characters but I'm not going to bother mentioning them all. I am going to start by complaining about the more trivial things. I have a hard time understanding Kat and Grace's relationship biologically, and it isn't helped by the fact that Grace calls Kat 'Cousin', and Kat calls Grace 'Aunt'. Before I can answer, Grace sails in, attired for visiting. A belted salmon dress makes the most of her narrow waist, and under the wide brim of a matching hat, her face looks nearly pretty-but, as always, a bit too thin. "I hope you slept well, cousin," she says. "Surely we can trust Elsie, Aunt Grace. She's been here since she was just old enough to work, has she not?" Probably something to do with respect? I don't know. Let's move on to the romance. The romance in this book was horrendous and is an insult to all other books in the genre. I picked up the book because there was nothing about romance in the synopsis and it wasn't classified as one. I know that most books have some degree of romance in them, but this was terrible. Best description is a love triangle that isn't a love triangle. Both of her 'love interests' are pretty flat and one dimensional and we don't really get to know or meet them. And other readers (on Goodreads) noted it wasn't anything really developed either. Kat is a very head-strong character and its also the reason why she doesn't really fit into England's high society. She is absolutely sure that the ex-gamekeeper of the estate is the murderer and doesn't examine any other possibilities. "This is my brother's blood, on his paintbrush. I found the place where he was painting just before he died, and this was buried in the snow. Stella found it, really. And the old poacher, Mr. McAllister, came upon me there-what are the chances the he would be at the very spot? He knows something, Henry-something he doesn't want to say." I cradle the cool little body in my arms. She's even smaller than death-a true runt. "Henry," I say, "McAllister did this. He threatened her, and now he's made good on it. That man killed my dog." "Mr. Dowling, I'm a poor companion today," I say apologetically. 'But as we have a moment to speak, I must ask you again about your thoughts on Mr. McAllister. (view spoiler)[ The note John left, it ... it seems too easy, too unlikely. He seemed such a simple, good man to me, (hide spoiler)] and McAllister such a menace-we know him to be a thief, and to have great knowledge of the woods about Waltingham-"
I could go on and on, but I don't have the book anymore and its tedious to type everything out. I'll give Kat credit though, she at least went to investigate the spot where she believed her brother died, but I'm still annoyed and very upset. The end of this book was just so rushed, not properly written (in my opinion) and didn't make sense. How did John manage to place the note inside George's watch if Henry planted it on him as 'evidence' that he's a thief and that it was 'for the best'? "Hello, Katherine," says the woman, finally looking at me. She's slender and stands as tall as a man. Her hair, scraped back from her spare face, is as black as mine. "I am Lady Katherine." I say, shivering and ridiculous in my nightdress. It would be awesome to see her back in Virginia trying to adjust back to the farm girl life. Also, could someone please explain the definition of 'spare face'? Overall: It wasn't the best book, but it gets two stars for a good idea, a realistic setting, and an extra .5 star for being one of the few historical mystery books out there. It was a light read and helped pass the time. Rounded to 3 stars since Goodreads doesn't have a half star option. I didn't really had high expectations when I started this book: I absolutely adore the cover so I looked it up here on goodreads. And I must agree with everyone else: this book isn't bad, it's just simply not good. The writing is bad. We know nothing about the characters, they're one-dimensional. The relationships are just too quick, they don't evolve as they should. We just receive the informations that the heroine befriended Jane and she loves mr x. But that's all. We don't know why, how, noth I didn't really had high expectations when I started this book: I absolutely adore the cover so I looked it up here on goodreads. And I must agree with everyone else: this book isn't bad, it's just simply not good. The writing is bad. We know nothing about the characters, they're one-dimensional. The relationships are just too quick, they don't evolve as they should. We just receive the informations that the heroine befriended Jane and she loves mr x. But that's all. We don't know why, how, nothing. And it's just too annoying, or at least for me. The story felt too rushed, and too obvious. I have to admit at the end there was one twist which was pretty unexpected - or at least for me. So why I'm not saying it's bad: With her writing she was able to create a feel of the 1800's, which I really enjoyed. The heroine: Katherine wasn't annoying or anything like that, we just don't really know a lot of things about here (like the other characters).